On this page, I will share information about my OTHER passion, competing in triathlons and duathlons. You might say that I have one foot in the garden and the other on the track. Thanks to my sponsors for their support and generosity. 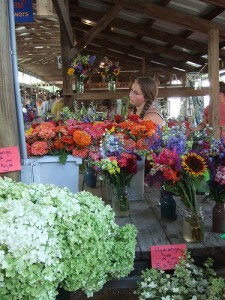 Please give them your business and enjoy the winning benefits of their high quality outstanding products and service. Also, “like” them on Facebook!! 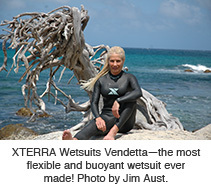 XTERRA Wetsuits [www.xterrawetsuits.com]: Love the Vendetta & Velocity speedsuit! Cytosport [www.cytosport.com]:Live on Cytomax fresh Apple and Fast Twitch Grape!! 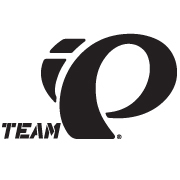 Team Pearl Izumi [www.pearlizumi.com]: High quality and cool products at the forefront of the design and construction of performance apparel. Be sure to check out their incredible line of running shoes. 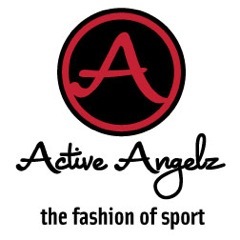 Active Angelz [www.activeangelz.com]: Women specific endurance lifestyle apparel. Finally women’s tri clothing designed by women with style and taste. Be sure to check out the faux leather tri outfit and the amazing rhinestone studded cycling jersery. Fab!! In 2012 Tracy 3-peated as National Champion in her age group (50-54) this year in Burlington VT. She was interviewed prior to her race. See the link provided below. She had 5 first place overall female finishes in her 5 local races. She was 1st Grand Master again at St. Anthony’s Triathlon in Florida. 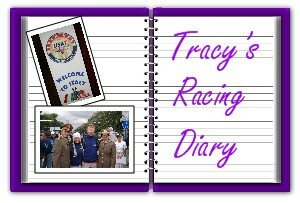 World’s in New Zealand was special in that Tracy’s son Zach competed with her and her husband Jim for the first time as part of Team USA at the World level. Team Austome as they are known were interviewed as a family by the International Triathlon Union. Please see link and photos from New Zealand. A new lesson was learned at this years world’s as Tracy raced it with food poisoning (no food and barely any fluid for 30 hours prior to race) and managed a 4th place out of 64 women. Not exactly what she was hoping for however many valuable lessons were learned–first no shell fish prior to a race and second how resilient we can be when we are determined!!! Tracy won Silver this year at the Sprint World Championships (50-54 age group) in Beijing, China and repeated as Sprint National Champion this year in Burlington Vermont. 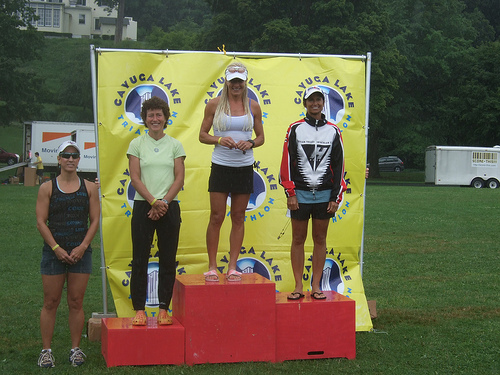 She was 1st or 2nd place overall in her other 6 triathlon events in 2011. She won the Sprint World Championship (50-54 age group) in Budapest, Hungary in September 2010 racing as a member of Team USA. She had the honor of being the official blogger for the team during the World Championships (link through tracylive.com). She then went on to win the Sprint National Championship later that month in Tuscaloosa Alabama (11th overall). She raced to 7 overall wins and one 2nd place overall spot for her other events in 2010. Tracy is a bit of a celebrity at home. She speaks on the benefits of multi-sport and life balance. She attends training camps and group workouts and interacts with many local triathletes, and has been featured numerous times in her hometown Sunbury News and in Columbus Monthly Magazine. She is sponsored by Orthopedic Foot & Ankle Center, Fleet Feet Sports, Tri-Tech Multisport, Zoot, XTerra Wetsuits, Cytosport, Scott Sports, and Rudy Project. 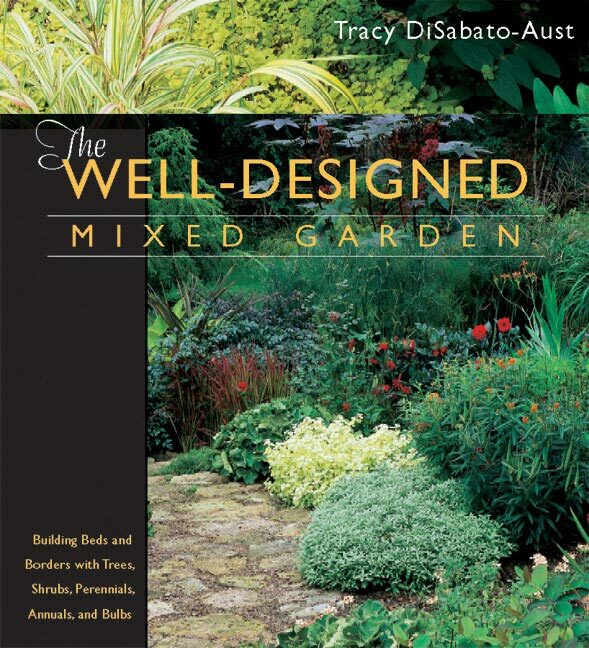 When she’s not training and racing Tracy is an international best-selling author of 3 books, professional speaker, and award-winning garden designer. 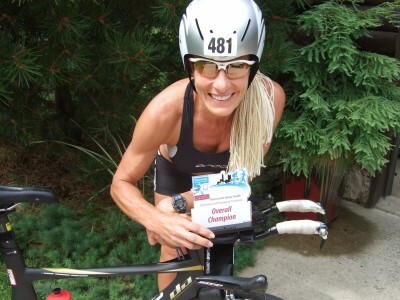 She is also the wife and mother of triathletes. Ryan Peterson is a rising star in the triathlon community. From Richmond, Va., the 17-year-old was last year’s USA Triathlon junior duathlete of the year. Saturday, Peterson broke through with another high-level performance on triathlon’s biggest stage in the United States. Competing in the 15-19 age group, Peterson cruised to the top overall men’s time in the sprint national championships. “I started (triathlons) when I was 12. I have the legs for it and I’m getting in there and racing with the big boys,” Peterson said. Peterson churned out an unofficial time of 1 hour, 5 minutes and 20 seconds for the sprint course that consists of a 1.5-kilometer swim, 20-k bike and 5-k run. On the final leg, Peterson ran a personal best, an effort spurned on by a keen tactical choice at the Depot Street hill. Continuing the youth trend, 20-year-old Abby Levene was the overall women’s winner after racing to a time of 1:11:30 in the 20-24 division. Tracy Disabato Aust, a former world champion from Sunbury, Ohio, hung tough with some of the juniors, finishing 15th overall in the field of 188 women finishers. In her seventh year of running in triathlons, Disabato Aust turned it into a family affair. Her husband, Jim Aust, nabbed third in the 50-54 division while their son, Zachary Aust, sped to seventh in the 20-24 age group. Summer family gatherings are fun. Burgers on the barbecue, toss a little Frisbee, backyard volleyball; watch a game or two on the tube. Nothing too strenuous because it’s time to relax, right? Now imagine a family weekend get-together that includes competing with hundreds of other athletes swimming, cycling and running against each other and the clock for an hour an 15 minutes during a demanding sprint distance triathlon. 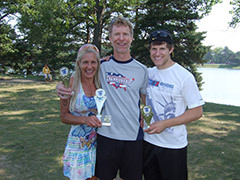 That’s what Trenton Township residents Jim Aust, Tracy DiSabato-Aust and their son Zach did when they competed in the USA Triathlon sanctioned Wendy’s International Triathlon & Duathlon held on Sunday, June 12, at Alum Creek State Park. At 1:17:10 Jim was fifth overall out of 528 competitors, and won the 50-54 male age group; Zach, who came in a minute behind his father at 1:18:10, was ninth overall and second in the highly competitive 20 to 24 male age group; and Tracy was 18th overall with a 1:21:10, was the second female across the finish line, and placed first in the 50-54 female age group, over 19 min- utes in front of the second place finisher in the 50-54 female age group. To put that in a different perspective, father and son finished in the top 10 overall; the entire family, father, son and mother, finished in the top 20 for the one-half mile open water swim, 17-mile bicycle ride and 5K run. Tracy, who is so competitive that she has eight sponsors, won the women’s race, all ages, in 2009 and 2010; in 2008 she came in second overall. Jim and Tracy have been competing for years. 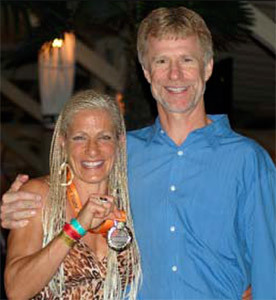 Last year at the 2010 ITU Sprint World Championship race in Budapest, Hungary, Tracy finished first in the women’s 50-54 age group; Jim came in 13th in the male 50-54 age group. 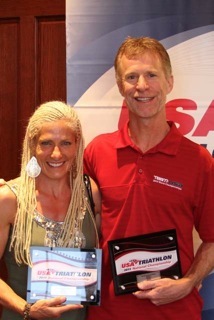 Jim and Tracy have both qualified to compete at this year’s ITU Worlds in Beijing, China, in September. Even more impressive, Zach, at 22 years old and a pre-med student at Eastern Kentucky University, is only in his second year of competing in triathlon. Zach ran Cross County and Track while attending St. Francis DeSales High School, but Jim and Tracy said they never pushed him to compete in triathlon; that it was Zach’s personal decision to pick up the sport. Jim said with Zach on the course, racing has become more fun that it’s ever been; that it’s, in Jim’s words, a blast to have him excited about it. Tracy said the two generations competing in the same sport and the same triathlons has become a great way to stay connected with their son. Tracy said she believes that Zach has become infected with the triathlon bug; that once people become involved in the sport it’s difficult to stop. What’s next for Jim, Tracy and Zach? With competitive races on the horizon, Jim, Tracy and Zach follow demanding training schedules. Jim and Tracy swim at the Westerville Recreation Center and bike and run along Trenton Township roadways near their home. Tracy added that she and Jim acknowledge their eastern Delaware County roots wherever they race. 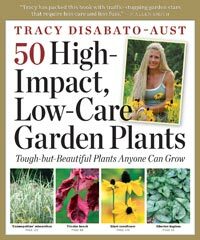 Jim Aust is a dentist with a Columbus practice; Tracy DiSabato-Aust is a horticulturalist and designer who has written gardening books and lectures internationally. Both Jim and Tracy are TeamUSA athletes. Many older area athletes train for marathons and triathlons, hoping to run (and swim and cycle) and complete the race – maybe even turn in a respectable time. But imagine competing in the 50 to 54 age group and winning a triathlon. Take it a step further and imagine winning the national age-group title – and the world age-group title. That would be, as they say, awesome, right? Something to dream about? 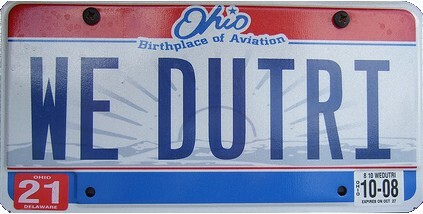 Except Trenton Township resident Tracey DiSabato-Aust doesn’t have to dream about it … she did it. Just two weeks out from winning an ITU sprint world title in Budapest, Hungary, Tracy DiSabato-Aust (Sunbury, Ohio) earned the female 50-54 championship in 1:13:02, and she was quick to acknowledge a network of supporters that so many age group athletes enjoy. “I’ve had a lot of support from my family and friends; it’s wonderful to make all the hard work pay off,” said DiSabato-Aust. 2010 Race Season: Budapest Bound for Worlds!!! The 2010 race season has been such a thrill. The highlight for me and my husband, and training partner Jim, was that our son Zach started racing as well. How fun it was to have him home from college and getting out on the roads, in the pool, and on the race course alongside us. It truly brought the “childlike” excitement of the sport back into play. And as Sheila Taormina (Olympic Gold Medalist) said when we met her at her incredible HFP swim workshop “The family that trains together stays together”. How cool that at the Elite Endeavors Triathlon in Sylvania, Ohio the Austs all made the top 10 overall with Jim at 6th, Zach at 7th (and only his 3rd tri) and me at 10th (1st overall woman). I’m excited with the season so far with 7: 1st Overall Female race finishes ☺, 1: 2nd Overall Female (to Master’s Elite Robyn Williams) and 1 :National World Qualifier :1st Age Group (by 10 min) and 4th Overall missing the Overall podium by 3 secs☺. (Race results below) I was also happy to have made the USA Triathlon 2009 All-American Ranking as #13 in my age group moving up from #54 AA in 2008. Now the countdown is on for Sprint Worlds in Budapest, Hungary on September 11th, 2010!! Under the guidance of our amazing coach Brian Grasky of Grasky Endurance Jim and I both decided, based on our successful short-course racing this season, to race sprint at Worlds and again at Nationals on September 26th 2010 in Tuscaloosa Alabama. My dream for Budapest is to represent Team USA on the podium for my age group!! And hopefully again at nationals and qualify for Beijing 2011 (I’ve been Sprint National Champ runner-up for the past two years). I have been asked while in Hungary to blog and post photos for Team USA on the usatriathlon.org website. So please follow me and my fellow world-class competitors during this incredible international age-group event. Send us positive and “fast” energy”☺ GO USA!!!! USA Triathlon Sprint National Championship Tuscaloosa, Alabama: 1:13:02 1st Age Group 50-54… National Champion:) 🙂 & 11th overall. 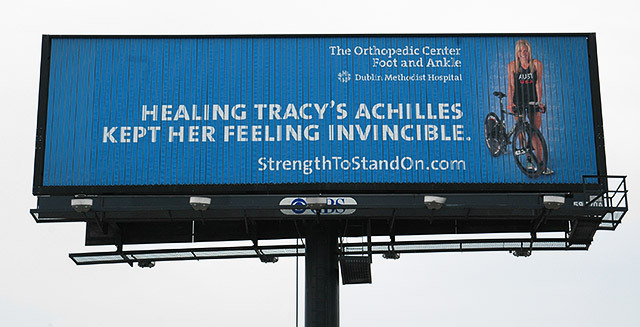 Thanks again to my fantastic sponsors who help keep me in top form: Fleet Feet Sports, Orthopedic Foot and Ankle Center (I’m currently on their web ad and one of their billboards in Columbus Ohio ☺, see below), Tri-Tech Multi-Sport, Cytomax, and Rudy Project. The 2009 race season had a slow start due to an ACL repair in February (from a skiing fall). But I think it made me appreciate the joy of being able to compete in the sport of triathlon even more. I felt blessed, and anxious, for my first race in June, at the Wendy’s Sprint Triathlon, Columbus OH. What a shock and thrill to take first place overall! This lead to 11th in the world at the ITU World Championships in Australia! It was a rewarding, exciting, and inspirational season. Below are some of the highlights. Meet my incredible former coach, Coach Troy Jacobson. If you want to be stronger and faster than ever, and injury free check out his informative sites and consider Troy as your coach–www.spinervals.com and www.coachtroy.com. I was honored to be a guest on Coach Troy’s podcast. 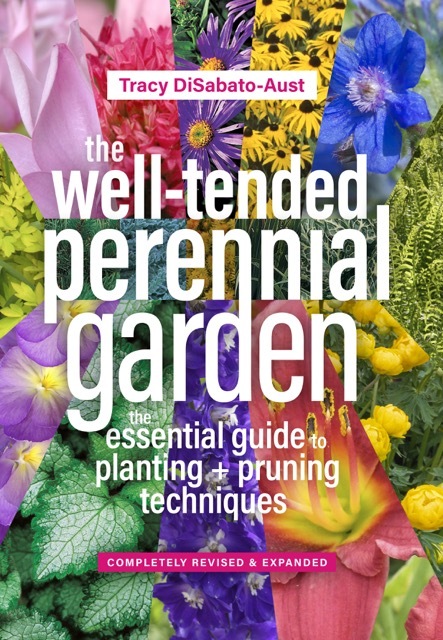 Click here to give my interview with Kevin Patrick a listen. For sound advice on nutrition for endurance training I turn to Dr. Rick Kattouf , Author of Forever Fit and Founder of TeamKattouf, Inc. For some great information on fuel for optimum performance go to www.teamkattouf.com. 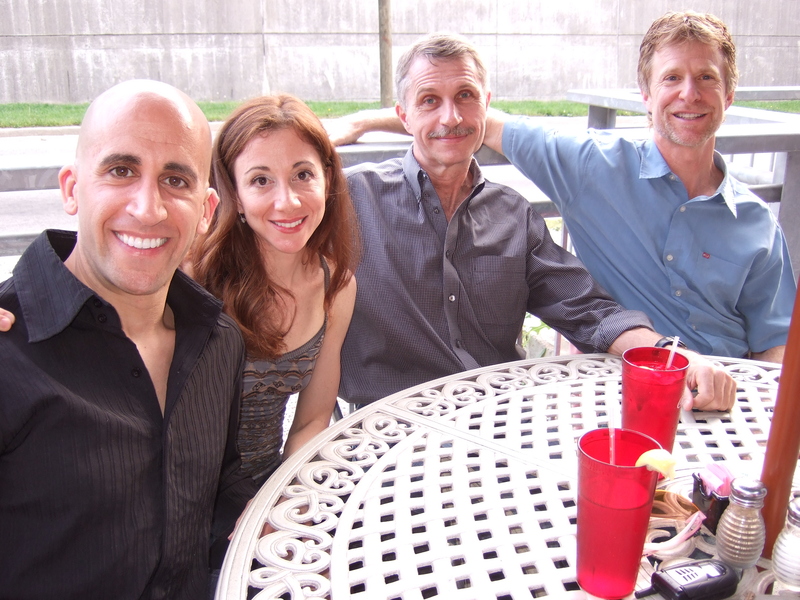 Pictured here waiting for our carb loading meal before Du Nationals in Richmond, Va. are (L-R) Rick Kattouf, Gail Kattouf, Ashley Halsley and Jim Aust. 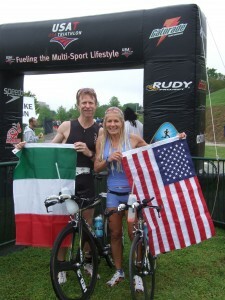 This photo is from the USAT Duathlon Nationals, Richmond VA. We qualified for Team USA and Duathlon Worlds in Rimini, Italy on September 28, 2008!!! USAT Age Group Nationals 9/20 -– 12th :Q Team USA! It was a thrill of a lifetime to compete for Team USA in the 2008 Duathlon World Championship, in the lovely coastal town of Rimini, Italy. What an honor to be racing among the top duathletes from around the globe and hear people yelling “Go USA” as you ran or biked by! The Opening Ceremony and the Parade of Nations, where over 50 countries participated, gave you the feeling of being part of the Olympics. It was a fun time for athletes to meet and visit with other members of their own team but also to connect with the athletes from different countries. The course was flat and the bike was fast (both were a touch long!). Team USA had 220 athletes and was the largest team at the World Championship. We garnered 11 medals (3-Gold, 4-Silver, and 4-Bronze). I was delighted to be 10th in my age group (5th American), while Jim was also very pleased to be 15th in his age group (3rd American). Enjoy the photos! 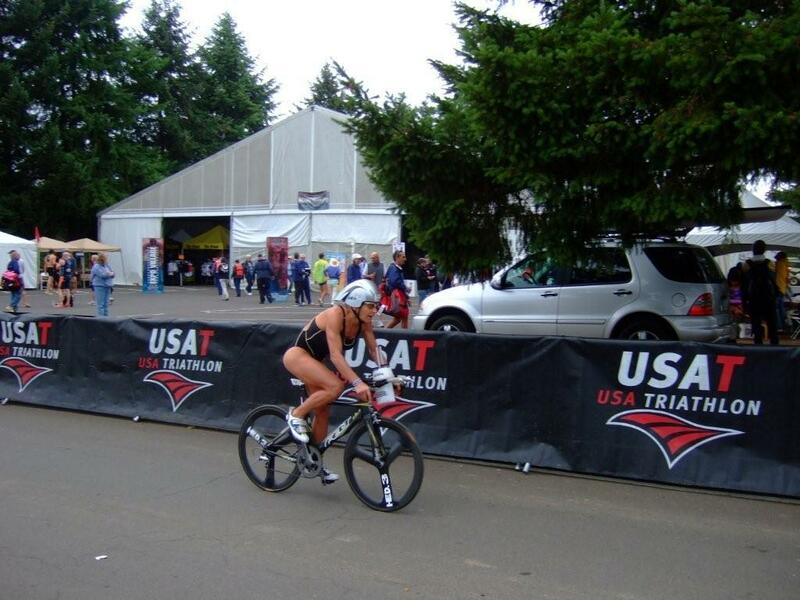 What a thrill to compete at USAT Age Group National Championship at Haag Lake, outside Portland OR with the top competition in the country. All the big “girls” and “boys” in the sport came out to vie for a spot on the USA team to compete in triathlon worlds on September 13, 2009 on the Gold Coast of Australia. The top 16 per age group would qualify and I was overjoyed to make the team with my 12th spot in the 45-49 age group (moving up to 50-54 next year—the only thing to look forward to with advancing age!!). The bike and run courses were challenging with lots of rollers and some tough turns which ma de me nervous, and had me wishing for better technical skills on the bike. The afternoon was highlighted by the elite race featuring 2008 Olympic Team talent such as Julie Swail Ertel, Laura Bennett, and Matt Reed. I hope you’ll share in some of excitement with these photo from both the age group and elite races as well as the inspirational Endurance Film videos! Right: Tracy finishing the bike and securing her spot on Team USA for Tri Worlds 2009! My husband Jim and I enjoyed participating in the USAT Age Group Sprint Nationals: Cuyuga Lake Traithlon, at Taughannock Falls State Park in Trumansburg, NY (near Ithaca) on August 3, 2008. The course was beautiful starting with the swim in the sparkling Cayuga Lake (one of the Finger Lakes). The bike through wine country was a rolling course, with a challenging uphill directly at the start! 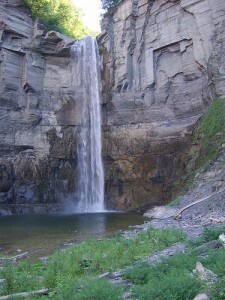 Then the run wound through the park and featured a turnaround at the falls– which are 3 stories higher than Niagara. 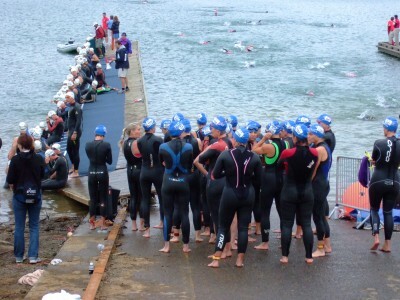 Over 600 athletes participate d in the race with many age groups (including ours) containing 30-40 triathletes. Numerous All-American’s came out to rally for national titles. 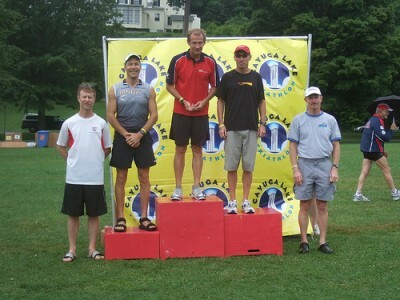 I was thrilled to be named the Sprint National Champion for the 45-49 age group. This was fortunate as I was actually second in my age group and then moved up to first when the first place speedy Jeanette Shelow-MacDougall was moved up and named Overall Master Champion. She was awesome and second female overall. I was delighted with 7th overall female. Jim pulled off a fantastic 5th in his age group (50-54) with this being only his 3rd triathlon ever—preferring the duathlons. The swim isn’t his favorite leg but he made up by having the fastest bike leg in his age group. The race director Jane Miller and her staff and volunteers did an amazing job organizing the event and being readily available for help and tons of cheering and support. Ithaca was beautiful with a fun farmer’s market on Saturday featuring several perennial and shrub nurseries as well as cut flower vendors. I couldn’t resist buying a gorgeous tillandsia (a type of bromeliad) to bring home. What a fun and rewarding race weekend!